feb-apr2019. san jose, costa rica. THE SOUNDTRACK TO MY THREE MONTHS OF LIVING IN COSTA RICA HAS BEEN ALMOST EXCLUSIVELY, THE 4 TWENTY ONE PILOTS’ ALBUMS: SELF-TITLED, VESSEL, BLURRYFACE, AND TRENCH. THIS UPCOMING 4-PART PHOTO SERIES WILL FEATURE CAPTIONS WITH THEIR LYRICS DESCRIBING AN EVEN DEEPER CONTEXTUALIZATION OF MY OVERALL PURE VIDA EXPERIENCE. as it’s the fourth and final part of this series, i should probably mention that every photo in the entire series was shot from the hip. i never raised my camera to my eye. so, i never really knew what i was capturing until i got back to my room and went through them. i can’t believe how much i hate. pressures of a new place roll my way. no, we are not just graffiti on a passing train. this culture is a poacher of overexposure. i’ll morph to someone else. i’m just a ghost. hide you in my coat pocket, where i kept my rebel red. i felt i was invincible, you wrapped around my head. i’ve always been collected, calm, and chill. i want you to follow me down to the bottom. underneath the insane asylum. sometimes i feel cold, even paralyzed. my interior world needs to sanitize. nice to know my kind will be on my side. i don’t believe the hype. and you know you’re a terrible sight. i’m lighter when i’m lower. i’m higher when i’m heavy. in city, i feel my spirit is contained. i move slow, i want to stop time. i’m sorry i did not visit. did not know how to take it. when your eyes did not know me. i needed change of pace. couldn’t take the pace of change. you’re loving on the psychopath sitting next to you. you’re loving on the freakshow sitting next to you. apr19. San Jose, Costa Rica. El Fortin, what’s left of an old Spanish fort. Cultural center, Escuela República de Argentina. Monument to Volunteers: pays respect to those who served in the volunteerism movement of the 1860’s with the founding of The Red Cross and other organizations. Iglesia de la Inmaculada Concepción. Standing since 1797. 20apr19. San Jose, Costa Rica. I captured this in NYC in November 2018. This week Attorney General William Barr publicly released a redacted version of the Special Counsel Robert Mueller’s report, almost a month after he delivered it to Barr. The redacted report differed substantially from Barr’s March 24 letter, as well as from statements delivered by Barr at a press conference hours before the report’s release — casting Barr more as a defense attorney for Trump than an attorney general. Concerns grew further when it was revealed Trump’s White House attorneys had previewed the report in consultation with the Justice Department days earlier. On Thursday, as the redacted report was released, Trump, who had expressed no interest in reading the report, seemed confident he had turned the corner and was in the clear. As the press and public finally dug into the contents of the redacted report and statements by current and former White House official witnesses, by Friday, Trump shifted back to anger and attack mode, starting by retaliating against former White House counsel Don McGahn. After reading the report, Senator Elizabeth Warren became the first 2020 contender to call for impeachment hearings. I found this in Miami, FL in December 2018. Trump’s attorneys continued to stonewall and seek to block requests from House Democrats for information, alarming even Senate Republicans who this week spoke out on his empowering his office at the expense of Congress. Republicans also for the first time publicly spoke out on Trump’s reliance on acting secretaries, with the regime shrinking, and power increasingly consolidating to Trump, his family, and a few trusted aides’ hands. It’s not illegal for Trump’s head to spin around while he vomits copious amounts of green bile either, but he’s definitely not fit to be President, he’s definitely not exonerated and Barr definitely couldn’t go any lower. For the third year in a row, U.S. standing in Reporters Without Borders’ annual World Press Freedom Index declined. The U.S. fell three spots to 48th of 180 countries, just below Romania. For the first time since the index was established, the U.S. fell into the ranks of countries whose treatment of journalists is considered “problematic.” The group cited Trump’s rhetorical hostility. TIME reported it has been over 300 days since the Pentagon held a press briefing. Defense officials have also stopped identifying senior officials given prominent assignments. Part of the shift is from Trump’s penchant for surprises. There is also a reluctance to deal with the media. The role of Defense Secretary, vacated by Jim Mattis in December, remains with an acting secretary. White House daily press briefings have also been dramatically cut back: there have been just two briefings so far in 2019 — the last one took place 38 days ago. On Sunday, WSJ reported lawyers for Trump have been working on a counter report which is 140-pages long, but according to Rudy Giuliani, the lawyers plan to whittle down to 50-pages. On Sunday, NYT reported that since the Barr letter, Trump has felt emboldened, confident and liberated. As staffers brace for the redacted report to be released, Trump has no interest in reading the full report. Aides say Trump plans to act as if the redacted report is extraneous to the Barr letter, which in his mind said case closed. He is escalating his language to feed his base, and also to enrage the media and political rivals. An aide to Rep. Omar told Politico “there has been an increase in threats” against the Congresswoman since Trump’s Friday tweet. Omar’s office reported the threats to the FBI and Capitol Police. NYT reported Trump has stepped up his attack of Rep. Omar ahead of 2020 and has privately said his attacks on Muslims are being well received by his base — similar to his success with this line of attack in 2016. On Friday, federal authorities arrested a Florida man, John Kless, 49, for leaving voicemails threatening to kill Rep. Omar, the other freshman Muslim woman Rashida Tlaib, Rep. Eric Swalwell, and Sen. Cory Booker. Politico reported that Trump will not nominate anyone to serve on a United Nations committee on racism, continuing the regime’s retreat from international bodies that monitor human rights. On Sunday, AP reported a Wisconsin middle school gym teacher was placed on indefinite leave after she separated students by race and asked black students to research games enslaved children played. On Monday, Immigration and Customs Enforcement reversed its decision to deport Jose Gonzalez Carranza, the spouse of a soldier killed in Afghanistan and parent of a 12 year-old, allowing him to return to the U.S.
On Tuesday, in a lawsuit brought against DHS and ICE by two migrant families, a federal appeals court in the 4th District ruled detainees do not have to be held in the same state as their children. The report recommended Congress enact emergency legislation to make it easier for the Trump regime to detain children with their parents indefinitely — calling for legislation to roll back the Flores agreement. On Thursday, the U.S. 9th Circuit Court of Appeals upheld that most of California’s “sanctuary” laws can be enforced, rejecting the bulk of a lawsuit brought by the Trump regime. The decision was authored by a Republican appointee. The panel refused to block California’s law prohibitingpolice from notifying federal immigration authorities of the release dates of immigrant inmates. On Thursday, a new Housing and Urban Development proposal rolled out by Secretary Ben Carson would evict families from public housing if just one member is considered to be undocumented. Several far-right pundits and websites started conspiracies on what caused the blaze, with some attempting to blame racial or religious minorities for the outbreak of the fire. On Saturday, NYT reported that although Federal Reserve Chair Jerome Powell has denied Trump is influencing Fed policy, the central bank has largely moved in the direction that Trump wants in recent months. On Monday, WSJ reported former Federal Reserve officials and foreign central bankers at the International Monetary Fund event expressed concern Trump has weakened the central bank and its global role. Officials expressed concern that Trump has interfered with the Fed’s independence, with his continued public criticism and nominating cronies who are extremists and loyal to him. On Tuesday, Bloomberg reported the White House is talking to candidates to replace Stephen Moore and Herman Cain as Trump’s nominees for the Federal Reserve Board. On tax day CNN noted with changes under the GOP tax bill, the 10 states with the largest increase in refunds for 2018 were all red states in 2016, and the 10 states with the largest decrease in refunds were all blue states. On Wednesday, AP reported that Ivanka said Trump asked her if she was interested in the job of World Bank chief, but she passed on the opportunity, saying she was “happy with the work” she is doing. On Wednesday, Treasury Secretary Steve Mnuchin said he planned to hire Fox News contributor Monica Crowley as his spokeswoman. The hire comes as House Democrats demanded Trump’s tax returns. On Wednesday, Bloomberg reported Rick Perry is planning to resign as Energy Secretary in the coming weeks. Perry would become the 16th member of Trump’s cabinet to depart. On Monday, the Interior Department’s internal watchdog said in a letter that it has opened an investigation into ethics complaints against Secretary David Bernhardt, who was confirmed by the senate last week. On Monday, the House’s Intelligence and Financial Services committees subpoenaed Deutsche Bank and other banks for documents related to Trump and the Trump Organization’s finances. The committees also subpoenaed banks including JPMorgan Chase, Bank of America, and Citigroup, and is also seeking information related to possible money-laundering by people in Russia and Eastern Europe. Alan Garten, the Trump Organization’s lawyer, said the company is weighing trying to block the subpoena. While Deutsche Bank has been cooperative, its lawyers said they will consult with the White House. On Monday, Politico reported Trump lawyers William Consovoy and Stefan Passantino urged Mazars USA not to comply with a subpoena House Oversight Committee Chair Elijah Cummings issued Monday. The lawyers warned of potential legal action, putting Mazars “on notice,” and calling the subpoena a politically motivated scheme by Democrats to take down Trump. On Monday, CNN reported Republican lawmakers are concerned with the White House snubbing House Democrats, saying the failure to comply bolsters the power of Trump’s office at the expense of Congress. Several Senate Republicans also voiced concern with Trump’s growing reliance on using acting secretaries, circumventing the Senate process, and his threats to send migrants to sanctuary cities. On Tuesday, WAPO reported Trump’s attorneys are not planning to comply with Congressional requests for information, likely resulting in a protracted legal fight that could test the power of congressional subpoenas. Trump’s lawyers have already refused to turn over information on granting security clearances and meetings with foreign leaders. White House Counsel Pat Cipollone is also preparing for legal battles over subpoenas. Protracted legal fights will drain lawmakers’ times and resources, and the cases could drag beyond the end of the Congressional session. Trump has told aides he is furious with the inquiries and does not want to cooperate. On Tuesday, Rusal, the aluminum company partially owned by Russian oligarch Oleg Deripaska which was recently removed from the U.S. sanctions list, announced it will invest in a Kentucky aluminum mill. Rusal will invest $200 million in a taxpayer-backed aluminum mill Braidy Industries plans to build in exchange for a 40% stake. Braidy would not have been able to form the partnership if sanctions were still in place. On Tuesday, Trump vetoed a resolution to end military assistance in Saudi Arabia’s war in Yemen — his second veto. Trump said the measure harms bilateral relations and interferes with his power as commander in chief. On Monday, the DOJ announced a redacted version of the Mueller report will be released on Thursday, the day before Passover and Easter Weekend, and during the two weeks when Congress is out of session. On Tuesday, NBC News reported former and current White House officials are concerned the Mueller report will expose them as a source of damaging information on Trump, and his wrath will follow. Some officials and their attorneys sought clarity from the DOJ on whether names of those who cooperated would be redacted from the public version, but said the DOJ refused to provide a response. On Tuesday, U.S. District Court Judge Reggie Walton, a George W. Bush appointee, in response to a lawsuit by BuzzFeed to release the full Mueller report said Barr has sowed public mistrust with his handling of the report. Judge Walton said Barr “created an environment that has caused a significant part of the public … to be concerned about whether or not there is full transparency,” but denied BuzzFeed’s request. Monmouth polls found 28% say the country is headed in the right direction and 62% say things are on the wrong track. Trump’s net approval fell from -7 in March to -14 in April (40% approve/54 disapprove). Trump also said “You’ll see a lot of very strong things come out,” indicating he has apparently been briefed ahead of the news conference. Shortly after, the DOJ announced Barr would hold a press conference at 9:30 a.m. on Thursday ahead of the release of the report. Deputy attorney general Rod Rosenstein will join, but Robert Mueller and his staff will not. The DOJ said the press conference will take place before the release of the redacted report to the media and the public. Journalist noted the unusual nature of holding a press conference without providing materials. On Wednesday, NYT reported DOJ officials have had numerous discussions with White House lawyers about conclusions in the Mueller report in recent days. The talks have helped Trump’s legal team prepare its strategy and response. The discussions have added to concerns about how Barr has conducted himself since he received the Mueller report four weeks ago. There is also a sense of paranoia among Trump aides about his reaction, and that the report will provide a road map for retaliation by Trump against current and former officials who spoke to Mueller’s team. DOJ rules do not require Barr to make the report public. The House Judiciary Committee has already voted to authorize a subpoena of Barr to release the full report — which could be sent within a day. On Wednesday, House Judiciary Chair Jerrold Nadler told reporters Congress will receive a copy of the redacted report hours after the press conference, adding he is troubled the White House has been briefed. Shortly after, WAPO reported according to anonymous sources the DOJ will be releasing a lightly redacted version of the Mueller report, offering a granular look at the ways Trump may have obstructed justice. The DOJ also revealed in a court filing that a “limited number” of lawmakers would be allowed to review, in a private setting, part of the Mueller report related to the criminal case against Roger Stone. On Thursday, BuzzFeed reported for the first time, Australian officials confirmed in a letter a meeting betweenformer high commissioner Alexander Downer and former Trump adviser George Papadopoulos. At the March 2016 meeting in London, Papadopoulos told Downer that Russia had political dirt on Hillary Clinton. The meeting led to the FBI opening an investigating into Trump’s links with Russia. On Thursday, ahead of Barr’s new conference, Trump sent a total of 11 tweets, some quoting Fox News shows hosts and conservative group Judicial Watch. On Thursday, Barr held a news conference, hours before the Mueller report was released and without Muellerof a member of his team present. He said the report will be released to Congress between 11 a.m. and noon. Barr made repeated reference to the phrase “no collusion,” echoing language frequently used by Trump, even though collusion is not a legal term. Barr also said Trump was “frustrated and angered by a sincere belief that the investigation was undermining his presidency.” Journalists noted the tone sounded more like a defense attorney than a U.S. Attorney General. HBO rebuked Trump for using a “Game of Thrones” meme, saying in statement we “prefer our intellectual property not be used for political purposes.” Nonetheless, Trump pinned the tweet to his page for two days. Axios reported Jay Sekulow said he first saw the Mueller report on Tuesday afternoon, and that Trump’s legal team made two visits to the DOJ to view the report securely late Tuesday and early Wednesday. In a letter, Speaker Pelosi and Senate Minority Leader Chuck Schumer, said they wanted testimony “as soon as possible” from Mueller. Rep. Nadler released a letter to Mueller seeking his testimony no later than May 23. There were several major inconsistencies between what was in the redacted Mueller report, and what Barrcited in his March 24 letter and news conference. WAPO gave Barr a “Three Pinocchios” rating. False statements included saying the White House “fully cooperated” with Mueller, saying Barr followed precedent releasing the report to Trump’s lawyer early, and indicating he and Rosenstein should have the last word. 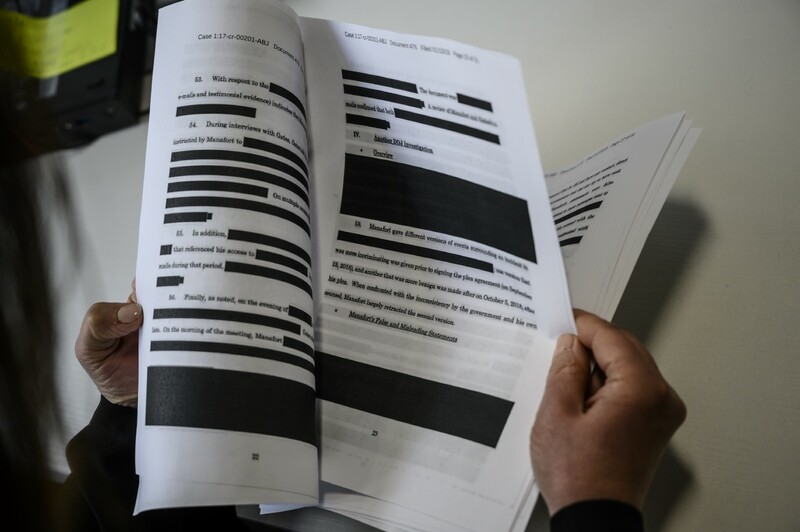 Of the 448-page redacted version report released, more than one-third of the Mueller report’s pages contain at least one blacked-out word. Some pages were almost entirely blacked out. The redacted report was released on April 18, almost a full month after Mueller delivered his report to Barr on March 22. Barr heavily redacted the sections relating to evidence of the Trump campaign’s outreach to WikiLeaks. Much of what was included in the unredacted report had been previously reported by the media. The report summarized Trump’s written responses to Mueller’s questions as “inadequate.” Trump said he either could not remember, could not recall or could not recollect a total of 36 times. The report found 10 episodes involving Trump potentially obstructing justice. The report also found a pattern of behavior by Trump to harm the Mueller investigation. Mueller did reach a conclusion on obstruction, citing under DOJ practice, a sitting president cannot be charged with a crime, and has a great deal of constitutional authority to give orders to other government employees. The report said the term “collusion” does not have a settled definition in federal criminal law and was not used. Mueller instead looked for “coordination” between Trump’s campaign and Russia. The report found Trump told Corey Lewandowski to tell Sessions to curtail the investigation. Lewandowski set up a meeting but it never happened, then delivered the message to Sessions through an intermediary. The report found Trump also told then chief of staff Reince Priebus to secure Sessions’ resignation, but he did not follow through. Sessions carried a resignation letter whenever he visited the White House. Mueller found “numerous” links between the Trump campaign and Russian government as it carried out its social media influence and hacking campaigns, but evidence was not sufficient for criminal charges. The report found the Russian government “interfered in the 2016 presidential election in sweeping and systematic fashion,” and that Internet Research Agency (IRA) began targeting the U.S. in early 2014. The report found Papadopoulos suggested to a representative of a foreign government that the Trump campaign had received an explicit offer from Russia for help by releasing Hillary’s hacked emails. The report found Trump repeatedly asked campaign aides to find Hillary Clinton’s deleted emails. As part of that effort, Michael Flynn reached out to GOP operative Peter Smith and former Senate staffer Barbara Ledeen. The report found that Paul Manafort discussed with Konstantin Kilimnik a plan to let Russia control part of Ukraine, and discussed Manafort’s strategy for winning Democratic votes in Midwestern states. The report found Trump’s legal team told Michael Cohen to keep his Congressional testimony “short and tight, not elaborate, stay on message, and not contradict” Trump, but made no mention of Trump’s involvement. The report found Trump directed White House counsel Don McGahn to lie to the media and say he had not directed him in June 2017 to fire Mueller. McGahn refused and took notes during the conversation. The report found Trump directed Deputy National Security Advisor K.T. McFarland to draft an internal lettersaying he had not directed Flynn to discuss sanctions with Russia ambassador Sergey Kislyak. She refused. The report found Trump tried to limit what was disclosed about Donald Jr.’s Trump Tower meeting, including his role in drafting a statement that the meeting was about adoptions. His lawyers denied he played a role. Days before the Trump Tower meeting, Donald Jr. said he was pursuing a lead to get negative information about the Clinton foundation. At the meeting were Rick Gates, Eric Trump, Manafort, Hope Hicks, Ivanka, and Kushner. The report found Sarah Sanders said she lied — calling it a “slip of the tongue” — to the White House press on two occasions saying “countless” FBI agents had told her they were thankful Trump fired FBI Director James Comey. The special counsel found evidence of other crimes, and made 14 criminal referrals. Only two of the 14 — cases involving Michael Cohen and Gregory Craig in Week 126 — are publicly known. The report said in March 2017, after Comey briefed the “Gang of Eight,” Senate Intelligence Chair Richard Burr shared “information about the status of the FBI investigation” with the White House counsel’s office. Rolling Stone rewrote Barr’s four-page letter to include full quotes from the Mueller report which Barr has selectively edited down to partial quotes. The meaning of several passages was dramatically different. On Thursday, reporters waited at the White House South Lawn to ask Trump about the Mueller report as he left for the holiday weekend for Mar-a-Lago. Trump avoided his customary stop to take a few questions. White House senior adviser Kellyanne Conway called Thursday the “best day since he got elected,” while Trump’s legal team decided not to publish a counter-report they had spent months compiling. Mueller’s report covered possible coordination between the Trump campaign and Russia, but the team did not investigate whether Russian attempts to access voting systems, which occurred, were successful. WAPO reported the Mueller report revealed how Trump bred an atmosphere of chaos, dishonesty, and malfeasance in the upper echelons of the regime, not seen since the Nixon administration. Trump spent months plotting to thwart the Mueller probe and enlist his senior aides to help — most refused orders. Trump repeatedly ask regime members to lie to the public, deny true stories, and craft false storylines. Bloomberg reported Trump grew angry by Friday, particularly at McGahn and former Staff Secretary Rob Porter, who both spoke extensively to Mueller. Aides wondered if Trump might seek retribution against the two. Trump also tweeted “Watch out for people that take so-called “notes,” when the notes never existed until needed,” in apparent reference to McGahn and possibly his chief of staff Annie Donaldson. On Friday, Rep. Nadler’s committee issued a subpoena to the DOJ demanding access to the full Mueller report, including grand jury testimony and other material not made public, by May 1. On Friday, a DOJ spokesperson called the request “premature and unnecessary,” claiming Barr released the report with only “minimal redactions,” and would allow lawmakers to see a less-redacted version. On Friday, Speaker Pelosi and Minority Leader Schumer rejected a DOJ offer for 12 senior lawmakers to see a less-redacted version of the report, demanding all members of Congress be able to see the full report. On Friday, the Trump campaign hired its own in-house attorney for its 2020 reelection bid, shifting the business away from Jones Day, the law firm where McGahn is a partner. On Friday, Sen. Elizabeth Warren became the first 2020 candidate to call for Congress to begin impeachment hearings after reading the redacted report and citing the “severity” of “misconduct” detailed. On Friday, in the first poll conducted since the redacted Mueller report was released, Reuters/Ipsos poll found Trump’s approval fell to 37%, down 3 points from an April 15 poll, and the lowest level in 2019. The same poll found Trump’s approval at 43% shortly after the Barr letter, which shared a much more flattering and limited version of the report. On Friday, lawyers for Maria Butina asked in a court filing that when she is sentenced next Friday, after spending nine months in jail for acting as a foreign agent of the Russian government, that she be sent back to Russia. On Friday, House Democrats said they will examine Prince’s testimony to the House Intelligence Committee in November 2017, which is different in several key respects from the Mueller report, for possible perjury. Inconsistencies include that Prince told Congress the meeting with Dmitriev happened by chance, and that he was not acting as a representative for the Trump transition team or the campaign. On Saturday, NYT reported the Mueller report revealed that contact by Russians like Dmitriev was part of the Kremlin’s outreach efforts during the campaign, which then shifted into high gear after Trump’s victory. The report revealed Putin sought back-channels of contact and influence with Trump’s team, and many Americans participated on topics from Trump’s desire to build a Moscow hotel to U.S. policy toward Ukraine. The report also revealed in December 2016, Putin convened an “all-hands” meeting of his top oligarchs to discuss the risk of the U.S. imposing further sanctions to retaliate for Russia’s interfering in the election. The Congressional Budget Office estimated an increase of 1.4 million uninsured Americans from 2016 to 2018, with much coming from Medicaid where the Trump regime has imposed new work requirements. America Media Inc. sold The National Enquirer to James Cohen, the CEO of Hudson News, ending the publication’s longtime association with Trump and its efforts to promote him and bury embarrassing stories. A journalist reads a redacted court filing from the Special Counsel Robert Mueller in the Paul Manafort case. The final report from Mueller’s Russia investigation released on April 18, 2019 left much of the public unsatisfied because it was heavily redacted, stripped of significant evidence and testimony that the investigators gathered. you seem so out of context in this gaudy apartment complex. a stranger with no door key explaining that i’m just visiting. and i am finally seeing why i was the one worth leaving. and i have to speculate that god himself did make us into corresponding shapes like puzzle pieces from the clay. smeared black ink. your palms are sweaty. and i’m barely listening to last demands. i’m staring at the asphalt wondering what’s buried underneath where i am. last week i had the strangest dream where everything was just as it seemed. don’t wake me. i plan on sleeping in. i feel i must interject here. you’re getting carried away feeling sorry for yourself. with these revisions and gaps in history. so let me help you remember. i’ve made charts and graphs that should finally make it clear. i’ve prepared a lecture on why i have to leave. calm down, release your cares. and i want life in every word to the extent that it’s absurd. and i’m screaming at the top of my lungs pretending that the echoes belong to someone, someone i used to know. i wanted to walk through the empty streets and feel something constant under my feet. …until our shells simply cannot hold all our insides in, and that’s when we’ll explode. i’ll be the fire escape that’s bolted to the ancient brick where you will sit and contemplate your day. i’ll be the waterwings that save you if you start drowning. i’ll be the phonograph that plays your favorite albums back as you’re lying there drifting off to sleep. i’ll be your winter coat buttoned and zipped straight to the throat with the collar up so you won’t catch a cold. i want to take you far from the cynics in this town. we’ll cut our bodies free from the tethers of this scene. now i’m a novel made resourceful. i start a chain with my thought. cold pain. i cannot sustain it. that’s what i’m thinking, not what i’m drinking. these thoughts are pervasive. it’s not a statement but peace can be evasive. melt my happiness. some kind of fucked up mess. i need a bit of coffee and the warm sun. and the dusty ideas only half spun. i’m not the reason you’re looking for redemption. is it absurd for me to hurt when everything else is fading? i’m walking through each smile. she may contain the urge to run away but hold her down with soggy clothes and breeze blocks. she’s morphine, queen of my vaccine. she makes the sound, the sound the sea makes, to calm me down. we can’t lose touch, but we can let go. the nights of all my youth pressed into one glass of water. painless with a great closeness. legions upon legions of craftsmen handmade my feelings. mar2019. San Jose, Costa Rica. can you save my heavy dirty soul? yeah, i think about the end way too much. i’ve been thinking too much. help me. but i’m not good with directions and i hide behind my mouth. i’m a pro at imperfections and i’m best friends with my doubt. release me from the present. i’m obsessing all these questions. my shadow tilts its head at me. you are out of my mind. you aren’t seeing my side. i’m out of my mind. i’m not seeing things right. i’m a goner. somebody catch my breath. i wanna be known by you. 19apr19. San Jose, Costa Rica. sometimes you make me feel like i’m living at the edge of the world. “it’s just the way i smile,” you said. than to feel you deep in my heart. always the need to feel again the real belief of something more than mockery. if only i could fill my heart with love. i never said i would stay to the end. hopelessly drift in the eyes of the ghost again. she used to just stand there and stare and roll her eyes right up to heaven. and make like I just wasn’t there. she used to just stand there and smile and her eyes would go all sort of far away. and stay like that for quite a while. yesterday i got so old, i felt like i could die. yesterday i got so old, it made me want to cry. and you’re beautiful. you glow inside my head. you hold me hypnotized. i’m mesmerized. you, soft and only, you lost and lonely. you, strange as angels dancing in the deepest oceans. twisting in the water. you’re just like a dream. if it can’t be like before i’ve got to let it end. i don’t want what i was, i had a change of head. if it can’t be like it was, i’ve got to let it rest. i don’t want what i did, i had a change of tense. crying for the death of your heart. you were stone white. i’m lost in a forest all alone. and you finally found all your courage to let it all go. General Tomás Miguel Guardia Gutiérrez (December 16, 1831 – July 6, 1882) was President of Costa Rica on two occasions: from 1870 to 1876, and from 1877 to 1882.
i’ll stay awake, ’cause the dark’s not taking prisoners tonight. you think twice about your life. it probably happens at night, right? am i the only one i know waging my wars behind my face and above my throat? shadows will scream that i’m alone. life has a hopeful undertone. and since we know that dreams are dead, and life turns plans up on their head, i will plan to be a bum, so i just might become someone. i’m forced to deal with what i feel, there is no distraction to mask what is real. i find over the course of our human existence, one thing consists of consistence. and it’s that we’re all battling fear. oh dear, i don’t know if we know why we’re here. i’m semi-automatic. my prayer’s schizophrenic. i do not know why i would go in front of you and hide my soul, ’cause you’re the only one who knows it. don’t wanna call you in the night time. don’t wanna give you all my pieces. don’t wanna hand you all my trouble. don’t wanna give you all my demons. you’ll have to watch me struggle from several rooms away. but tonight, i’ll need you to stay. i’ll never be what you see inside. you say i’m not alone, but i am petrified. i can feel your breath. i can feel my death. i want to know you. i want to see. i want to say hello. 15apr19. san jose, costa rica.